This time, Feleipe Franks wasn’t pulled. This time, the Gators couldn’t dig out of the double digit hole they created for themselves against Big Blue. And this time, Florida lost to Kentucky- for the first time in 31 years- potentially shattering its season dreams before it really began. The Wildcats’ 27-16 win in the Swamp also marks Florida’s first loss in a conference opener since a 30-28 loss to Tennessee in 2004. The first clue that the streak was destined to end was when Kentucky scored first on a nine play, 91 yard drive that Terry Wilson capped with a 29 yard touchdown pass to David Bouvier. Florida would counter that with a field goal and a touchdown on its next two drives to take a 10-7 lead into the locker room and halftime. Wilson led the Wildcats on a 10 play, 90 yard touchdown drive to grab a lead they would not relinquish, and then added to it with another touchdown on the following drive. The Gators forced a 3rd and 16, but Wilson found Lynn Bowden for a 55 yard scoring strike. To its credit, Florida did fight back at the the end. Franks directed a 15 play, 99 yard touchdown drive to pull the Gators within 21-16. But Franks missed a wide open Malik Davis on the two point conversion. And on the Gators’ last ditch drive, Franks was strip sacked by Josh Allen with four seconds left on the clock on a weird, wild and wacky play that saw Kentucky’s Davonte Robinson pick up the ball and casually jog down the sideline, thinking it was an incomplete pass, and then take off toward the end zone. Gator guard Tyler Jordan tried to strip him at the goal line- I mean who knows, Jordan and Florida could have hypothetically recovered the fumble and returned it 100 yards through the entire Kentucky defense with some hook and ladders that would have dwarfed the craziness of the famed Cal-Stanford play- but Robinson got the ball over the goal line first for the final 27-16 margin. End of drive. End of game. End of streak. The officiating didn’t help matters, either. The referees incorrectly ruled that Evan McPherson’s 39 yard field goal was no good despite it hooking inside the right upright by several feet. That would have made it 21-13 late in the third quarter. And subsequent failures to stop the game clock after both a change of possession and a runner being pushed out of bounds helped the remainder of the game melt away faster for Kentucky. As bad as the officiating crew was, though- and it was bad enough for every member of it to rightfully lose his job- it didn’t cost Florida the game. The Gators were outplayed, and outright dominated by a Kentucky team they were favored to beat by two touchdowns. There were a number of superficial consequences from last night, not even including the broken streak, that are annoying because they will live on as footnotes in Gator history forever. Dan Mullen lost his first ever SEC game as the Gators’ coach. Mullen lost his first ever SEC game as the Gators’ coach at home, at night. 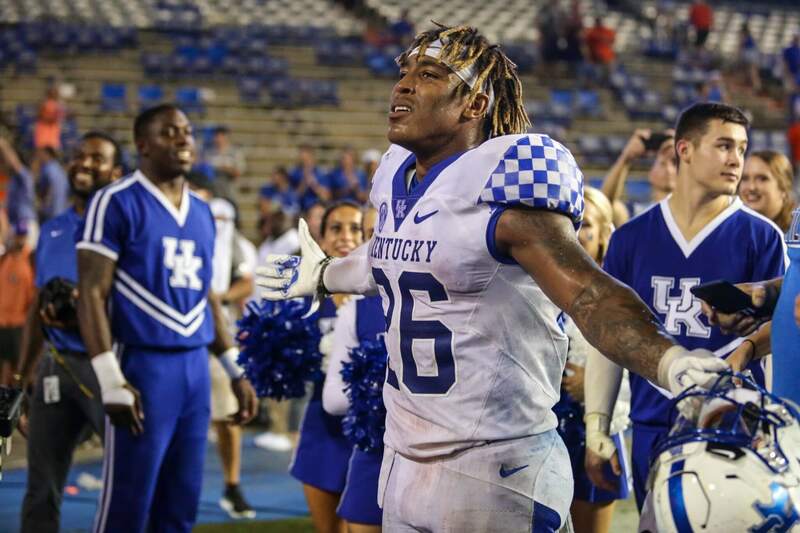 Conversely, Kentucky didn’t just break the streak in a game that Florida was favored in by two touchdowns, but they did it in the Swamp, under the lights. But those realities are far more frustrating than damaging. Put aside the likelihood of this statement for a second, and just consider the value of it at its core: the Gators still essentially control their own destiny to a national championship. Kentucky is not a good team, and will lose multiple times within its SEC schedule. Thus, Florida is still mathematically alive for the SEC East, which opens the door for an SEC Title and thus the College Football Playoff. But now here comes the caveat: if I’m Florida, I’m not worried about a national championship, an SEC Championship, a trip to Atlanta, or taking back the state. I’m not even worried about making a bowl game. I’m worried about something much more large scale. This is a bad football team right now, a really bad football team with a laundry list of seemingly insurmountable issues made worse by the horrible news that two starters- corner Marco Wilson and center Brett Heggie- are finished for the season. Florida’s fan base is pretty much engaged in a four way civil war between those who blame the loss on Franks, those who blame it on the offensive line, those who blame it on the defense’s inability to tackle and those who blame it on the coaching staff drawing up the wrong game plan. Guess what? All four of those camps are wrong. Or, more accurately, all four of those camps are 25% right. The big issue that Florida has is that it doesn’t have one big issue; it has several unrelated yet equally crippling ones. For starters, there’s Feleipe Franks. And let’s begin by burying the pretense that he’s made significant positive strides since last year. Franks wasn’t bad early- wasn’t great, but he wasn’t bad- but when the going got tough, he reverted back to his 2017 self. He threw every ball 90mph on a straight line, with no variation in the arc or velocity regardless of what kind of pass the defenders’ positioning called for. He missed wide open receivers, most glaringly Davis on the two point conversion attempt. He locked onto his first target, failing to go through his progressions while waiting for his primary option to get open; oftentimes, before he did, Franks would get sacked or worse, force it there anyway, which resulted in one interception and would have resulted in a second one had the defensive back not dropped it. It’s worth mentioning at this point that Franks is now a redshirt sophomore. If he were going to be a serviceable SEC quarterback, we would know it by now. The fact that he redshirted in 2016 because he wasn’t ready for SEC football, suffered a miserable 2017 season because he still wasn’t ready, and is still making the same mistakes that plagued him in 2017 despite an entire offseason getting first team reps under one of the greatest proven quarterback minds in the game proves he never will be ready. Was last night the worst game he’s ever played? No, but it came against one of the worst defenses he’s going to face in SEC play this year, so that’s not a good bar to set. He doesn’t have it. Accept it, or don’t, and try to convince yourself otherwise, but be prepared for more anguish and heartbreak down the road. But blame is like fertilizer. You have to spread it where it belongs. And first and foremost, the blame must be spread to Jim McElwain, whose profound lack of recruiting skills have left the Gators with not just the quarterback issue, but personnel issues throughout the roster. The offensive line, which looked suspiciously weak against Charleston Southern, was overall atrocious. Tyler Jordan had a pretty solid game for the most part, and Fred Johnson had one wicked pancake block, but the sum of the line’s performance was abysmal. Given his history of bad decision making, plus the bad decisions he made on the few plays in which he did have time to throw, I don’t believe Franks would have made good decisions had he consistently had time to do so, but his line did not help him out and give him the chance to do so. Florida couldn’t even run the ball very well behind its line, which they did fairly well the last couple of seasons with these same players on it. Then there’s the tackling issue. Specifically, Florida’s inability to do it. The Gators weren’t great at it last year, but they’ve somehow gotten even worse at it this year. Players took bad angles, failed to wrap up, and couldn’t set the edge throughout the game. True, Florida was missing starters David Reese and Cece Jefferson, and their returns should help strengthen this problem somewhat, but it wasn’t as if their replacements were responsible for 100% of the missed tackles. Everybody missed tackles. It’s a team wide issue. Lastly, the game plan was not the one that was best suited to stop Kentucky’s run heavy attack. Dan Mullen explicitly stated that he would not sell out to stop the run this past week “because then the other weapons would hurt us.” And he did not. The result: Kentucky racked up 303 yards on the ground. Yes, a lot of those yards were due to missed tackles, but with a more stacked box that was thinking run first, there would have been more defenders converging on Benny Snell and Asim Rose together, eliminating the one-on-one tackles Florida was forced to try to make in the open field. And on top of that, I’m not entirely sure Mullen put Franks in the optimal position for him to succeed, something that we were all positive was the one thing Mullen would do for each of his quarterbacks. So this Gator team does not have one singular issue right now. This team has a plethora of issues right now, issues that can be fixed as the season progresses- after all, there is a long season ahead of us- but if they’re not, the long season ahead will feel as such, and likely disproportionately so. Complacency may have been at least partially to blame- see Chauncey Gardner-Johnson’s guarantee that Florida would win- but there appear to be issues deeper than those that mentality issues can cause. And so for Mullen and the Gators, the task ahead is simple: fight on, get back to fundamentals and do all you can to right the ship before it capsizes. Blocking and tackling are fundamentals. Everthing else is built on these 2 foundations. What I saw can not be fixed in the 20 hours the coaches have to work with the players during the week plus game plan for the opponent. The players spent this summer goofing off and not busting their butts getting ready and it is showing. They were too busy with Tay Bang, air soft guns, Rain night club and wanna be gang bangers to develop the toughness Mullen was talking about. There are several sr/jr that need to be benched. Lets take our lumps with the underclassmen and get ready for the future. Why wasn’t Mullen at the game? Why was Randy Quaid on the Gator sidelines?